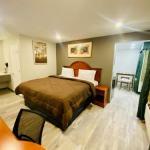 Low rates free Wi-Fi and complimentary parking add up to plenty of value for guests at the Ozark Inn & Suites. The low-rise Ozark Inn is home to 25 rooms all offering free Wi-Fi 27-inch cable TVs microwaves refrigerators and complimentary local calls. Non-smoking rooms can be requested. The in-house restaurant serves three meals a day including hot breakfasts every morning. The front desk is staffed 24-hours a bonus for guests arriving late. Road warriors are happy to know that fax and copy services are available on-site. Pets are allowed for a fee. Parking is free. The Ozark Inn is near the Arkansas River and a 14-minute walk from Arkansas Tech University. Mercy Hospital Turner Memorial is 15 minutes away by foot. The hotel is Its 12 miles from the Ozark National Forest and 18 miles from the Pig Trail Scenic Byway. Fort Smith Regional Airport is a 40-mile drive.